Where are they? What are they up to? Click the icons below to show the entry for each day; Click it again to hide the entry. The germ of the idea was a casual comment in 2013: "Wouldn't it be fun to be in Dublin for the centenary of the Easter Rising?" Desiree put it into words; it was shared with others at the Irish Society; it grew, and formed plans; it was discussed amongst enthusiuasts at planning meetings; it manifested itself in bank accounts & savings plans; it was the subject of travel booking inquiries; it was the cause of determined internet searching for intineraries; it took the form of payments; it grabbed the attention of many, but the commitment of a few. And then the idea became reality: To be in Dublin at Easter, 2016; to join in the commemorations of those events of 100 years ago; to honour those whose commitment to a cause saw the birth of a Nation. And that is how a group of 13 from the Hutt Valley Irish Society came to be in Dublin at the end of March, 2016. The Duffys left Wellington on the previous Saturday; the Janes on Tuesday; the Mulligans, O'Tooles, Clarkes & Mike Sprejkrise flew out on Wednesday. This last group of 7 went to Sydney to join an Etihad flight to Abu Dhabi. This 14-hour long-haul tried the patience and endurance, especially of Jeanette, who struggled throughout to calm her fear of flying (but she did it!). Abu Dhabi was impressive on a number of levels. The local airport staff at passport control were casual, un-hurried, remote, and un-engaged - something they will need to work on if the plans are to make the place a tourist mecca & not merely a transit facility. However, once through the controls we then had to deal with a 14-hour layover. The Mulligans had booked a room so they could have a shower, and stretch out for a nap. The others followed suit at a hotel at the airport. But having put down our bags, and grabbed a bite to eat, we all set off to Ferrari World (for the 'boys') and the Yas Mall, for those not interested in 'the World's fastest Roller-Coaster'. The Riders were most impressed, and clearly enjoyed themselves. The rest of us wandered the vast Mall, admiring the range of shops and brands, and getting lost in what felt like a giant maze. We then re-grouped, and arranged a taxi back to the Hotel, where a rest beckoned before check-in at the airport and the inevitable waiting around for (delayed) boarding. The plane this time was smaller, but no less crowded; and the flight was a 'mere' 8 hours! The Dublin arrival was a little after dawn, on a bright, sunny, cloudless day; the temperature, after the air-conditioned comfort of the aeroplane & terminal was 'bracing' and brisk. We're booked into the O'Callaghan Mont Clare just off Merrion Square. A delightful location (just opposite the National Gallery, down the road from the Dail and the National Museum, and 10 minutes walk to Grafton Street. We settled and set off as a group with John as our guide (he is, so he said, a 'local') to wander Grafton Street (several needed to by new SIM cards for our phones), then across the Liffey to O'Connell Street. This was blocked in part by preparations for Sunday's ceremonials. Back to Temple Bar by way of Ha'penny Bridge, just because we could, and from there back to Merrion Square. We were all taken aback by 1) how busy the City is - people everywhere; the city is jammed! and 2) how many 'foreign' accents we overheard; seemingly fewer Irish than 'other' Europeans. By the evening we had caught up with the Janes family and the Duffys. We had a light dinner at the Hotel and the 'travellers' had an early night. Today is sightseeing day in Dublin. The group expanded by 2 as it was joined by the Mulligans' eldest daughter Sarah Rose & her partner Pip, over from London). 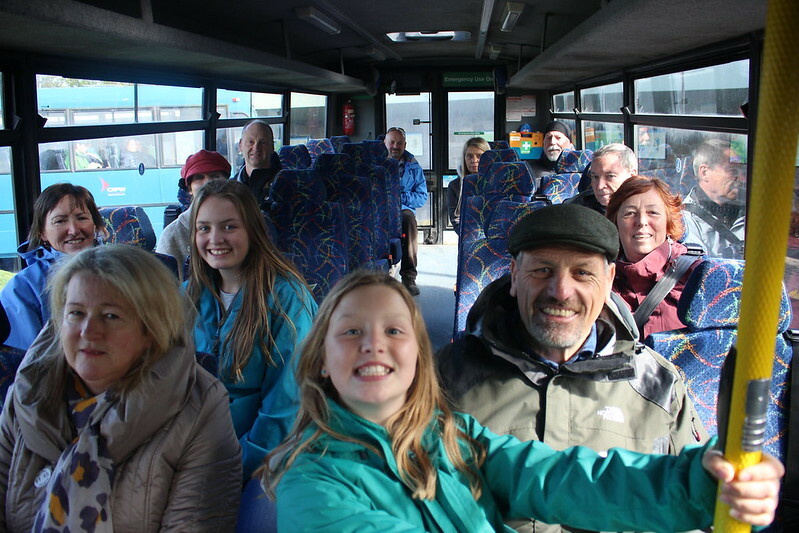 The group went in various directions with some heading to the Guinness Storehouse, or Trinity College to look at The Book of Kells, or St Stephens Green, while others set aside time to visit & spend time with family. As with Friday, getting about the city was difficult with crews setting-up for Sundays ceremonials, and large numbers of visitors thronging the strets. Most of the party meet up for dinner again in the evening. The Day of Ceremonies. The Mulligans had been invited to attend the Official Ceremony at the GPO from 1100; the others were free to find a spot to observe the Parade and watch proceedings on any of the large screens set up around the City. Most of the group set of for the area of St Stephens Green to find a spot to observe, while the Mulligans set off for O'Connell Street. They managed to work their way into temporary seating in one of the 'official' viewing stands directly alongside the GPO, and so had a first rate view of the official proceedings - the arrival of the dignitaries, the presentation of honours, the reading of the Proclamation, the Prayer for Peace, and the entire Parade march-past. In all the Ceremony and Parade took approximately 2.5 hours, ending at about 1400. After which, the City was awash with spectators, many of whom headed for bars, but some of whom tried to get to other attractions. However, a number of bus services were cancelled (because of street closures & strike action), and taxis were inumdated with fares. Today is the first day of the 'Tour' proper: meeting the bus and driver, and setting off for the trip around the Island. So, breakfast in the Hotel, pack & organise the bags, and then wait for The Mulligans, who decided to go for a walk. The coach seats 19, and there are 13 in the group, so a program of musical chairs will occur over proceeding days. Our driver is a 'Dub', and immediately strikes up an affinity with John & David (2 fellow Dubs), and decides to use the Cavan folk as a mechanism to to help build group identification. In other words, make fun of the Cavan Mulligans, so everyone else can feel part of the 'us'. Oh well, such is the burden of heritage! The first day travelling will take us from Dublin south and west to Blarney. Much of the trip is on modern motorways, but despite that, there are numerous occasions where the countryside reveals the depth of its history, with derelict castles, and views of narrow winding lanes, small fenced or walled fields, and villages with streets seemingly higgledy-piggledy and buildings right to the road edge. The Rock of Cashel provides a welcome respite from the Coach, and a refreshing walk in (bracing) fresh air. It's interesting that the ruins were once the residence of the King of Munster, and so, therefore, the fictional 'home' of his sister, Fidelma. She in turn is the key character of a series of medieval 'detective' stories set during the mid-seventh century AD. Sister Fidelma is not simply a religieuse, she is also a qualified dalaigh, or advocate of the ancient law courts of Ireland. The Mulligans seem to be the only ones aware of this connection, but that doesn't stop everyone else enjoying the visit. And lunch is refreshingly 'homely'. The climax (if you will) of the day is a visit to Blarney Castle and kissing the Blarney Stone. We're staying in the Hotel right alongside the Castle, and the 'largest Irish store in the world'. The latter proves a magnet for some, but for others the attraction was the nearest bar - Christy's! The Blarney Stone itself is surprisingly difficult to get at - a series of narrow winding stairs rising through various levels inside the Castle's Keep. At the top, pressure is applied to all & sundry to contort oneself into position to "kiss" the stone so the moment can be captured by a camera and the kissers sold a large photo of their moment just to prove they've done it. There is something about the whole experience which summs up a lot of what will follow over the next few days: a carefully crafted and entirely fictitious 'old Irish tradition' to which everyone cleaves, and the construction of an entire edifice of commercial enterprise to surround the 'experience' and find ways of separating the visitor from his/her coin. I'm in awe of the ingenuity, the gall, and the fun of going along for the ride! It's brilliant, if an almost complete sham! And that meant it was time for dinner, for which the bus-driver recommended The Thomond Pub in town - a Munster Rugby stronghold, with live music which impressed the young & young-at-heart! So, we've done the Blarney Stone, and now we're off to Ballyroe Heights Hotel, Tralee. Albeit with a few 'diversions' en route. The mid-morning break is in a 'mall' in Killarney which is depressingly half occupied, but has food, coffee, and (most importantly) toilets. These conveniences will form important focal points over the next days. There is a GAA store devoted entirely to Kerry gear (well, that's a surprise! ), so a couple of us are tempted to ask them if they have gear for Dublin or Cavan. I'm pleased to be able to report that (on this occasion) we resisted temptation. The rest of the day is devoted to touring The Ring of Kerry. This is a wild and rugged segment, around one of the peninsulas projecting out from the Island into the 'wild Atlantic'. We have lunch in a surprisingly mild 'Waterville' and pause to say hello to Charlie Chaplin and local GAA Football hero Mick O'Dwyer. And then, for something completely different, we pause to look at the Torc Waterfall. A brief stroll, persistant rainfall, pleasantly open beech forest, and a waterfall and river assisted by recent rain. We could have been anywhere in New Zealand. But of course we weren't; we're in County Kerry. So that gets us to the Ballyroe Heights Hotel, Tralee. And that means some of us head into Tralee, for a meal and a drink, others meeting old friends, while some choose a swim, and others just head for an early night. If you've seen one Peninsula, you've seen them all - right? Wrong! Something about Chalk & cheese comes to mind. If the Ring of Kerry is wild and untamed, the Dingle Peninsula is 'tamed', civilised, farmed and visited. So it's a marked contrast with the previous day. The weather helps, as today is sunny, clear, warm, and dry. At least, it is in the morning. Did I mention it was cold? No? Then: it was cold/bracing/brisk, for anyone coming from a late NZ summer, the weather is a jolt. The Dingle Peninsula is a tourist delight: it is picturesque, civilised, and in good weather a delight to walk (as we briefly do). We have lunch in the the Blasket Centre on the tip of the Dingle Peninsula overlooking Great Blasket Island. The Centre is a fascinating heritage centre/museum honouring the unique community who lived on the remote Blasket Islands until their evacuation at the insistence of the central Government in 1953. Dingle itself is also delightful (is that adjective becoming over-worked? Sorry!). Small, spontaneous, irregular, touristy, it both welcomes tourists and carries on it's normal life as though nothing was amiss! A pleasingly odd sensation, best illustrated by the casual way we were welcomed into the South Pole Inn at Annascaul, a pub honouring Tom Crean, an Antarctic explorer and companion of both Scott and Shackleton. And was honoured for his exploits. A touch of nostagia for Ray on this segment, as the bus-driver arranged for us to stop (briefly) in the grounds of the Garryowen RFC, where Ray had played rugby in his earlier years. Then on to the Cliffs of Moher. Once you get past the shock of the huge tourist arrangements - big carparks (full), efficient visitor centre, shops, cafes - the next thing to hit you is the highly organised walkways. Paved, signed, fenced, these are broad and spacious, and home to the occasional busker as well! The cliffs themselves are disturbingly high, but you can't get too close to the edge because of the walls (& signs!). The sea is a LONG way below, so the views are certainly impressive. After looking over the Cliffs we move on to a Pub for lunch (there's a pattern developing here! ), and then Lehinch for a stroll in the sunshine along a surf beach, where, despite the 9degrees air temperature the water is full of surfers! We're staying at the Bunratty Castle Hotel, but dinner is in the Castle itself - a "medieval banquet". Actually, it's more like a musical cabaret show, with food along the way. Some lovely singing & music, along with very nice Mead, and lively banter. But it's crowded! Nevertheless the Castle is interesting, and this is an entertaining slant on a 'guided tour'. We're headed for Galway City, but faced with a dilemma to begin the day. Seems the driver needs to help out a colleague who needs to return home, leaving a group of Japanese tourists stranded. There is grumbling from him, and occasional phone-calls, and a chance we'll face a major change in our plans. Desiree finally gives voice to the misgivings of most us, indicating her displeasure at an enforced late change to the contracted service we have paid for. At which point the driver suggests she (& we) consider the date. It's April 1st! Turns out Ray and he concocted the story & we all fell for it hook, line and souvenir tee-shirt! First stop is at Galway Crystal, where we're provided with a demonstration of crystal-cutting by hand - impressively precise! A few make some purchases, while others consider options for commissioning a special piece for the Club. Decisions are deferred until we get home & have talked it over some more. In Galway itself, we stop first at the Cathedral, a modern edifice which has all the feel of a much older building. Beautiful side-chapels, stained-glass windows, and ceilings. Well worth the time spent wandering. Our Hotel (The Meyrick) is right in the centre of the city, so everyone sets off to walk places - some just wander the narrow shopping streets, others visit the museum & Spanish Arch, while others find a pub. Dinner is in a Pub (An Pácún) just a stones throw from the Hotel. Another day based in Galway. Today, however, we're heading out of town, north to Connemara, where our route winds through rugged countryside, with ample evidence of stone field walls, and turf-cutting. Several stops today will give Desiree a chance to re-visit places associsted with her family. We pause at Maam Cross, where the John Wayne film The Quiet Man was filmed, and then drive on to Maam Bridge for another photo opportunity. Leenane is next, which also affords a spectacular view out over Killary Harbour, Ireland's only Fjord! After that we head to a Wow! moment, as we approach Kylemore Abbey. This is a picturesque complex with a chequered history. It began life as a family home for a nineteenth centure British industrialist, and then passed into the hands of Benedictine Nuns who were escaping the ravages of WW1, and who operated a school on the premises. While that has closed, the nuns continue to own & occupy it, but provide funding for it's upkeep by offering numerous tourist services - entry charges, a walled garden, visits to the Abbey itself, chapel, cafe &, of course, an extensive gift shop. It is truly a spectacular setting for an innovative enterprise. Dinner, back in Galway City, is had by most at the King's Head pub, just off Shop Street, where we're served by a Kiwi lass from Golden Bay! It's Farewell to Galway & The Meyrick, and off through Sligo to Mayo. We note Tuam and the N17 en route, with a stirring sing-along as we cruise the Road given fame by the Saw Doctors. Our first real stop is at the Ceide Fields Neolithic Site. This is a new one to the driver, so he's as interested as we are. It is a site at which a Neolithic settlement has been identified and is being progressively mapped and selectively excavated. The interesting Interpretaive Centre also provides lunch, so we don't rush the visit. Then, by winding local roads, we head over to distant Downpatrick Head, which we had spied from the Ceide Fields. Again, a new site for the driver, so he's interested in our reactions. Some stay in the bus; some go to view; some go to explore. The "Head" is a precipitous headland of exposed cliffs, crashing seas, and un-fenced edges. The latter provide contrasting responses: awe and adrenalin-fuelled excitement amongst the thrill-seekers; awe and adrenalin-fuelled fear amongst the less adventurous. But both offer a positive asessment of the site. The Wild Atlantic Way has certainly lived up to its name! The National Famine Memorial at the foot of Croagh Patrick is a striking structure in a picturesque setting beside Clew Bay. It consists of a dramatic sculpture in bronze by John Behan and depicts a "Coffin Ship" with skeleton bodies in the rigging. We're over-nighting in Westport. And for us all that means a visit to Matt Molloys after dinner, to see an authentic 'session' in a traditional Pub. Just how 'authentic' the session is, is a matter of debate and conjecture, but the music is entrancing, and the setting genuine. So we stay a while and soak it up. We're off to the north of the west - Donegal. This means a mid-morning stop in Sligo, where we mark the memory of an important figure. Firstly we manage to locate an impressive mural of Maud Gonne and a Yeats poem, and then an interesting statue of WB Yeats alongside a busy town street. We also chance upon the headquarters of The Yeats Society, where we're able to have morning tea. We then pause at Drumcliff, where Yeats was (eventually) interred. A group photo is called for, in our 'touring' tee-shirts, and a Yeats poem recited by Bridget. Which then meant we passed through the shadow of Benbullben, and on to Donegal Castle. This is, as the Irish are wont to say, "JAPS", or 'just another pile of stones'. But a Guide gives an interesting tale of the ruin, and the families who built it and lived in it, and the times through which it was in it's prime. Then we visit Slieve League Cliffs, at which some of us begin to wonder if there is a subliminal message being sent about heights and cliffs and steepness and edges and ....? Whatever unease anyone may have felt about the Cliffs is allayed by the sight of that night's Hotel: the Sandhouse Hotel. It reminds some of us of North Island West Coast beaches - a long, wide, gentle strand of sand, with gentle waves and, during dinner, a lovely sunset. It is also delightfully ramshackle, but spacious, warm, and welcoming. International Travel! Crossing into Northern Ireland today, where we will spend a couple of nights. First we call into (London)Derry, for a toilet & currency stop, and the chance to stroll about the imposing City Wall, and to overlook the few remaining murals. It is impressively wide - if is wide enough to comfortably accommodate the bus, and probably to allow it to pass another vehicle as well! We almost lose Molly, but Search & Rescue track her down & return her to her parents - crisis averted! Then it's on to the Antrim Coast, specifically to The Giants' Causeway, which is a gentle walk down to the seaside shared with thousands of other tourists to look in wonder at geometriclly regular shapes of the columns of basalt that make up the formation of the Causeway. Fascinating, eminently 'climbable', and easily accessed. Tourist needs checklist ticked, once the cafe provides lunch and gift shop browsed! Then a little further around the Coast is the Carrick a Rede Rope Bridge. Less 'touristy', and a little more 'wild' this is better suited to the trill-seekers amongst us, who all take to it with gay abandon. Having conquered that, we head off into Belfast, where we will spend two nights at the Europa Hotel. We wake to a grey, and damp, morning. But some amongst the party discover a new twist to a warming breakfast - whiskey available to pour on your porridge, along with honey, milk & sugar. As a result, one or two are tempted to linger a little over their start to the day. But we have a bit to get through, so it's onto the bus and off, wending our way through the morning traffic. In no time at all we're at the Port and the Titanic Centre. The Centre is a really striking structure, and a landmark that's hard to miss. Inside there is a wealth of information about the Harland & Wolff shipyards, the life and times of the workers, the city which watched in awe and excitement during the construction of the ship. There is even a 'ride' which takes you through simulations of some of the construction functions and to meet staff who worked in the yards. It finishes with information about modern underwater exploration of the wreck and the recovery of artefacts from it. But nothing about icebergs - a puzzling omission, surely? Then it's back on the bus for our own version of a 'black cab' tour. We travel, seemingly without purpose of real direction, through numerous Belfast districts. Noticeable are the advertising signs for up-coming elections, and for some it's brings a recognition that the name Sinn Fein, redolent of so much history, is now an accepted part of the political landscape in Ulster. But even so, you can't escape the history as we pass murals of the late Bobby Sands, and a billboard commemorating "100 years of the Ulster Solemn League and Covenant". The so-called "peace walls" (in what are euphemistically called 'interface areas'!) are a little confusing: their role of separating communities in conflict with each other is obvious and straight-forward; less clear is the motivation behind the encouragement of locals to add new graffiti over the top of existing graffiti. It makes for a jumbled and untidy mess in which the message is garbled at best. But then for "something completely different" we visit Crumlin Road Gaol. The Gaol is a nineteenth century listed building, recently restored and to guided tours. The weather has decided to do it's part to make us feel at home in this bleak and imposing edifice, by dropping the temperatures, and later puring a heavy downpour onto us, calling short the visit to the burial area of those executed. None are sad to get back on the bus, or to head back to the Europa so we can adjourn to one of the local pubs for a quiet drink and dinner. It was The Crown last night, so tonight it's Robinson's. For those born in New Zealand, the breadth and depth of Irish history can be a little overwhelming. Today we will be immersed in it. Having breakfasted (remember that porridge with whiskey?) and got ourselves sorted, Matt steers us South again. We play 'hide-and-seek' with the border crossing. The clearest indicators now are the change in language on roadsigns, and the lines marking the road edge! Gone are almost all traces of the armed police posts, barriers, and checkpoints. First stop is in the Boyne Valley, at Brú na Bóinne (Palace of the Boyne), overlooking the Boyne River. There is a large and very modern Vistor Centre (and inevitable carpark, cafe, and shop) from which we go to a small shuttle bus for a brief trip to Knowth. Knowth is a Neolithic passage grave and an ancient monument of Brú na Bóinne. It is the largest passage grave of the complex and consists of a large mound (known as Site 1) and 17 smaller satellite tombs. We're somewhat amused to find a staffer mowing the top of the largest mound with an electric mower, although he has the good grace to stop while we're listening to our very knowledgable Guide. In addition to the talk by the Guide, we also have the opportunity to go inside the Tomb to one of the chambers, to look around the countryside from the top of the Mound, and to puzzle/muse over the megalithic art incised into the stones. Without having visited a single art gallery during the tour, we have nonetheless seen quite a variety of art, especially in the last few days - from the formal public art on traffic roundabouts, to the statuary and graffiti in Belfast, and now the stone carvings in Knowth! Since it's available, we use the Cafe for lunch after the return in the shuttle bus. Next we're off the Belvedere House, near Mullingar (incidentally, the bus is nearing 'home', being based in Mulligan) in Co Westmeath. The house dates from the mid-18th century, and while not especially unusual or striking, it does have an imposing 'folly', known as the Jealous Wall after the owner fell out with his brother who lived on a neigbouring estate. The most interesting element of the house, strangely enough is in the kitchen area, in which are numerous display panels which recount the often lurid tales of life both above and below stairs. Then we're off to Trim Castle, in Trim, back in Co Meath. This is a Norman castle on the south bank of the River Boyne. It is the largest Norman castle in Ireland. It was built by Hugh de Lacy and his son Walter over a period of 30 years in the late 12th and early 13th centuries. The Castle was a centre of Norman administration for Meath, a new administrative area created by King Henry II of England. De Lacy took possession of it in 1172. He built a huge ringwork castle defended by a stout double palisade and external ditch on top of the hill. There may also have been further defences around the cliffs fringing the high ground. Indedd, from the upper reaches of the Castle one can see both a wide swathe of the surrounding countryside, as wall as the surviving wall and some of the associated buildings. The day was clear and cold, by the time we finish our tour of the Castle, the day is ending, and it is lit with a sharp late-afternoon glow. Better will follow, as it is floodlit during the evening. Dinner is in the Hotel, which is (coveniently) just across the road from the Castle. We're also joined later in the evening by Willie & Marie Cassidy & their daughter Tara. Reminiscing & catching up becomes the order of the (late) evening. And that's where we finished our Tour. We had started in Dublin, travlled south to Kerry, then up the west coast through Galway, Connemara, Mayo and into Donegal, before crossing by way of the Antrim Coast to the east coast and then south to finish at Trim, just a little north of Dublin. Indeed, a number of the group will be delivered to Dublin Airport, from there to go their various ways: the Mulligans off to London and then the Continent; the Janes to see family elsewhere in Ireland before they too, visit the continent; the Clarkes & Mike will go to Newcastle, before Mike heads to Holland; the Duffys and the O'Tooles head back into Dublin to spend time with family before returning to New Zealand. All made it safely back to the Hutt Valley by early May, 2016. Bryan Mulligan is behind the camera.